Hanoi (VNA) – Vietnam, a country grounded on agriculture and an important player in the global food system, is partnering with other members of the Asia-Pacific Economic Cooperation (APEC) forum to ensure food security in the face of climate change. Between 2005 and 2014, the region suffered 1,625 natural disasters or 40 percent of total disasters in the globe, with nearly 500,000 deaths and 1.4 billion others affected, accounting for 80 percent of affected people worldwide. Property losses in the period amounted to 520 billion USD, some 45 percent of total global economic losses caused by natural calamities. According to a report released by the UN Economic and Social Commission for Asia and the Pacific, natural disasters killed 4,987 people in 2016, affected 35 million people and caused estimated damage of 77 billion USD. In recent years, on average, agriculture absorbed 17 percent of total economic impacts caused by natural hazards. The agriculture sector is linked with industry and services through both demand and production. Reduced agricultural output, therefore, slows down overall economic growth. Disasters have undermined all aspects of food security by reducing food supplies and cutting incomes of poor communities. Poor communities can take years to recover from these inccidents, trapping them in a cycle of hunger and poverty. Being aware of the challenges, APEC ministers in charge of food security met for the first time in October 2010 in Niigata, Japan, where they approved the Niigata Declaration on APEC Food Security, the first comprehensive APEC plan on regional food security. Under the declaration, the ministers agreed that APEC economies would collectively pursue shared goals of sustainable development for the agriculture sector and facilitate investment, trade and markets. Following the first APEC Ministerial Meeting on Food Security (AMMFS) in Niigata, the ministers have gathered every two years to approve action plans on food security. Of note, within the framework of the APEC Year 2014 in China, APEC senior officials approved the APEC Food Security Roadmap towards 2020. The roadmap set a long-term goal of building a regional food system that ensures sustainable food security for APEC member economies, improves productivity and provides food at prices within the reach of low-income earners. Apart from AMMFS, in 2011, APEC established the APEC Policy Partnership on Food Security (PPFS) to intensify coordination between the APEC Business Advisory Council (ABAC), the private sector and other stakeholders in an effort to practically ensure food security in the region. 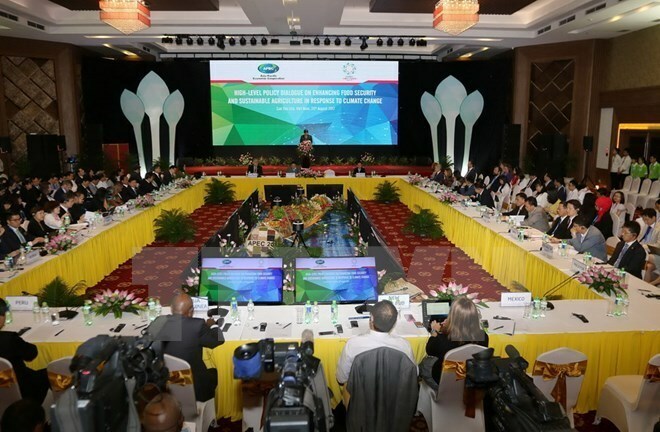 At the same time, a number of committees and working groupx of APEC have also met regularly to discuss food security. To realise the plans, Vietnam has worked with many regional countries to implement projects on climate change and food security. Canada, for example, has funded a project worth 1.1 million CAD (roughly 838,000 USD) to promote food security in Vietnam’s three northern mountainous provinces of Lao Cai, Lai Chau and Ha Giang. The project, launched in April 2016, aims to provide complementary food for children and create higher and more stable sources of income for small-scale female farmers. It is expected to benefit 15,000 malnourished children and 1,500 poor mothers in the three provinces. The project has also promoted appropriate post-harvest processing and agro-ecological practices among small-scale farmers, and launched an integrated food security analysis into public policy and programming at the National Institute of Nutrition and other government institutions in Vietnam. Japan has also assisted Vietnam in ensuring food security through a range of projects and programmes, including a 360 million JPY (3.6 million USD) project to help poor farmers buy fertiliser, a project valued at 469,131 USD to improve nutrition for children and ensure food security for the poorest andanother worth 149,208 USD to enhancefood security for small-scale farming households in central Quang Nam province, among others. As the host of the APEC Year 2017, Vietnam selected “enhancing food security and sustainable agriculture in response to climate change” as one of the four cooperation priorities of this year’s agenda, aiming to help APEC member economies cope with the increasingly severe impacts of climate change. At the PPFS Forum in the central coastal city of Nha Trang in February 2017, the Vietnamese Ministry of Agriculture and Rural Development raised three initiatives, including an action plan to realize the APEC Programme on Food Security and Climate Change; the Can Tho Statement on Enhancing Food Security and Sustainable Agriculture in Response to Climate Change; and an action plan to realise the APEC Strategic Framework on Rural-Urban Development to Strengthen Food Security and Quality Growth. The ministry also suggested focusing on the development of agribusiness to support the transformation of rural labourers in APEC member economies and on the impacts of climate change adaptation on food security strategies. These proposals were hailed by other APEC members, according to Tran Kim Long, head of the International Cooperation Department under the Ministry of Agriculture and Rural Development. 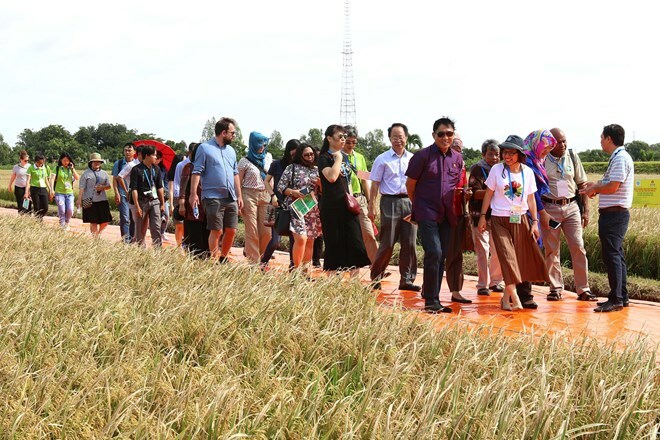 The APEC 2017 Food Security Week and the APEC High-Level Policy Dialogue on Enhancing Food Security and Sustainable Agriculture in Response to Climate Change were held in the Mekong Delta city of Can Tho from August 18-25. During the week, the APEC members adopted three documents - the Action Plan to implement the Multi-Year Framework Programme on Food Security and Climate Change, the Action Plan to implement the Strategic Framework on Rural-Urban Development to Strengthen Food Security and Quality Growth, and the Can Tho Statement on Enhancing Food Security and Sustainable Agriculture in Response to Climate Change. Vietnamese Deputy Minister of Agriculture and Rural Development Le Quoc Doanh said that the event contributed to implementing the priorities proposed by Vietnam while demonstrating APEC member economies’ commitment to realising the UN Sustainable Development Goals by 2030. As part of Vietnam’s initiatives, the Agricultural Technical Cooperation Working Group, the Policy Partnership on Food Security, the Oceans and Fisheries Working Group (OFWG), and the High-Level Policy Dialogue on Agricultural Biotechnology met for the first time, aiming to share experience, avoid overlapping activities and cooperate effectively. The groups considered whether they should meet for a second time in 2018 and evaluated the meeting's contributions to coordination in enhancing food security among APEC economies. Asked about cooperation prospects of the four groups after this meeting, Patrick Moran, head of the OFWG, said the event offered an opportunity to improve collaboration between the groups, consistent with APEC goals that all groups work together so that food security dialogues represent the interests of all APEC economies. Notably, at the high-level policy dialogue, Vietnamese Deputy Prime Minister Trinh Dinh Dung called on APEC member economies to support each other in building and developing sustainable, green agriculture adaptable to climate change. He called for greater efforts to implement the APEC Disaster Reduction Risk Framework, build a disaster prevention system, and improve post-disaster sustainability and restoration ability, with attention paid to community-based disaster risk management, sustainable rural development and ensuring the rights of coastal residents. APEC should connect with regional programmes from the Association of Southeast Asian Nations (ASEAN) and Mekong Delta Sub-region programmes, he said. The Vietnamese Government has paid heed to cooperation within APEC and will coordinate with other APEC members and development partners to ensure food security, he noted. Vietnam’s hosting of the APEC Food Security Week as well as its initiatives raised during the event were lauded by representatives of other APEC member economies. Pavel Krasilnikov, Deputy Director of the Eurasian Centre for Food Security of the Moscow State University, said Vietnam’s proposals are timely, explaining that globally, there are huge concerns about the impacts of agriculture on the environment.